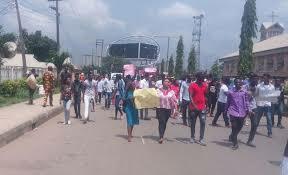 Further More He stated that as a mark of goodwill, the Vice-Chancellor was billed to hold a meeting with the students’ representatives at 13:00 hours on Tuesday, 15th May 2018. Also the management has granted a 3-day lecture free period to all students to enable them organize with their parents and guardians as regards their fees. The News is that the students disregarded all of these efforts made by the management,some students still deem it fit to cause choas which have the potential to cause a breakdown of law and order. The Managements said “It is against this background that the university has been shut down until normalcy is restored to campus. So Kindly Bear With Us as the School will resume normal activities soon.